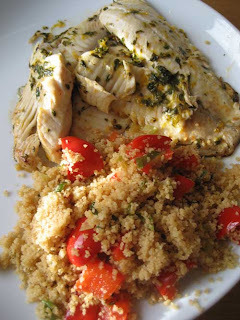 Here's a little something good for a hot summer night - Citrus Fish with Bell Pepper Couscous. This one comes out of Rachael Ray's magazine, Every Day with Rachael Ray. When I previously tried something similar, let's just say it didn't go well. Once again, my photography skills don't really do any justice to this meal. It was light and bright, with tons of flavor. Fish isn't something I make too often, so when I do make it, I'm always a little intimidated. This recipe definitely helped build my confidence and was easily made within 30 minutes. 1. In a shallow dish, combine 2 tablespoons EVOO, the parsley, lemon juice and peel, lime juice and peel, orange peel, hot sauce and thyme; season with salt and pepper. Add the fish and let marinate for 15 minutes. 2. Meanwhile, preheat a grill or grill pan to medium. In a medium saucepan, heat the remaining 1 tablespoon EVOO , 1 turn of the pan, over medium heat. Add the bell pepper and scallions, season with salt and pepper and cook until softened, 3 to 4 minutes. Add the chicken broth and bring to a boil over high heat. Stir in the couscous, cover and keep warm. 3. Grill the fish until cooked through, about 3 minutes on each side. The 2 year old that loves couscous and likes fish, too. This looks like a good one for the TX heat! PS--No Rachael Ray roundup? A Friday just isn't a Friday without it! I know, I know. I'm a bad blogger. I wish I had a good excuse. Sounds delicious - I'm always looking for different ways to use tilapia, since I buy the Costco bag. I'll have to try this!